Following their arrival at the Taj, the Duke and Duchess travelled to one of Mumbai's most famous public spaces, Oval Maidan. The Palace promised 'surprises' were in store at the venue and we were not disappointed with an afternoon of sporting activities. Named because of its oval shape, the large Grade I listed recreational ground hosts a number of popular sports including cricket and football . It is considered one of the most popular gathering places for locals and boasts stunning views of the city's skyline. 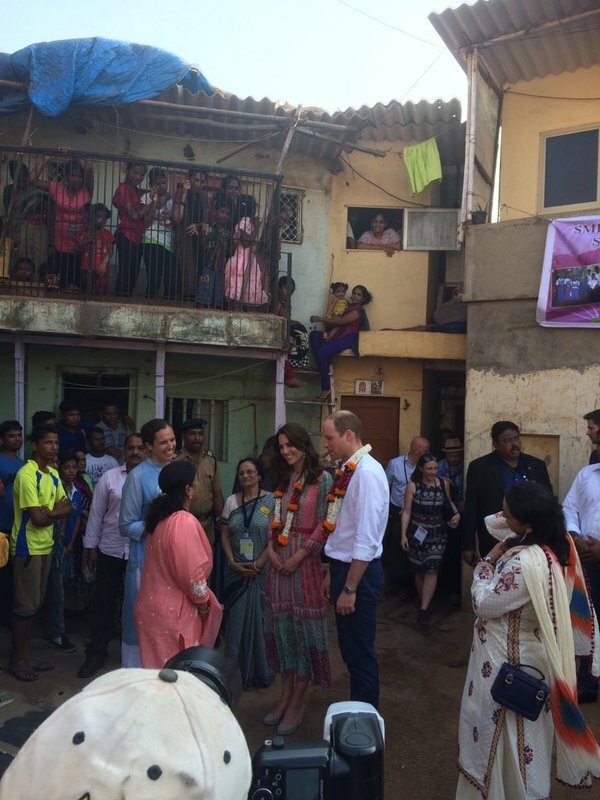 It's a must-see for tourists and was the perfect place for William and Kate to greet Mumbai. 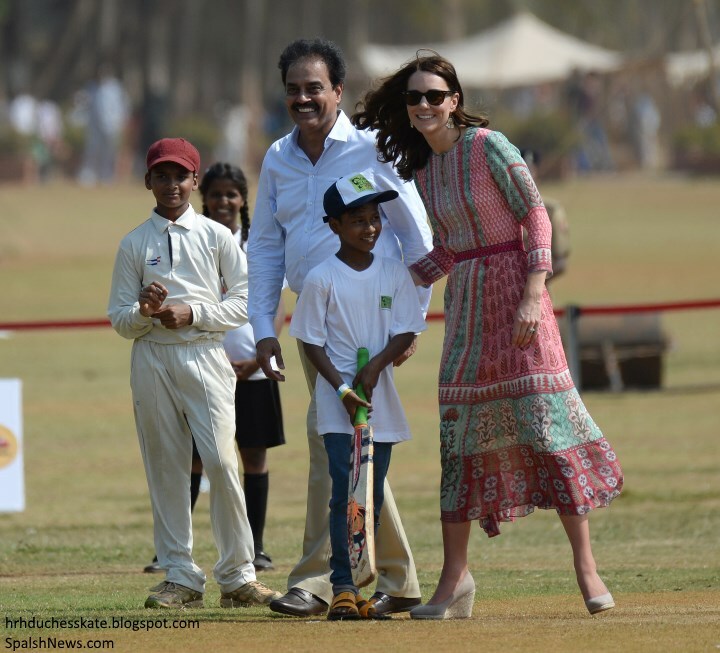 The Duchess was very much in her element as the cricket got under way. Of course, this brings back memories of the 2014 Royal Tour when Kate tried her hand at the sport in her red Luisa Spagnoli suit. Who better to enjoy a game of cricket with than legends Sachin Tendulkar and Dilip Vengsarkar. 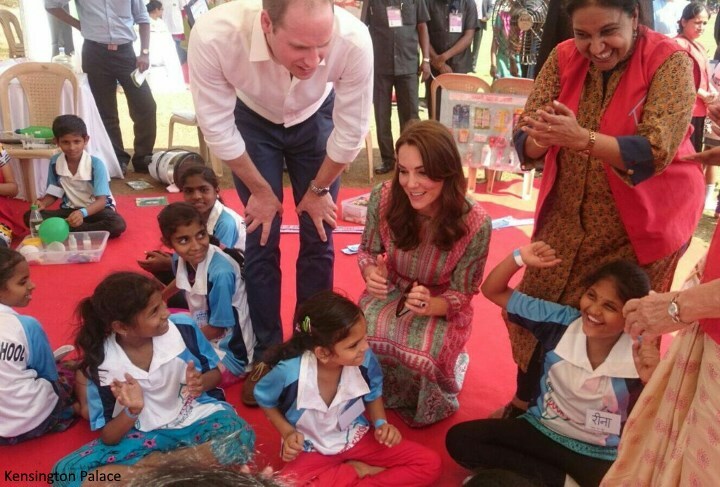 William and Kate played with children who live in slums around the city. The children were all incredibly excited ahead of the visit. Kate appeared to be having a fantastic time. The Duke and Duchess met with representatives and beneficiaries from local charities Door Step, Magic Bus and India Childline. Door Step School was established in Mumbai n 1988 with the aim of providing literacy to marginalised sections of society. It was built to focus on three problems: non-enrolment, wastage and stagnation. The Right to Education Act mandates free and compulsory education to all children in the age group of 6-14 years, however, there are still a large number of children who do not go to school. Door Step School helps these children get enrolled in government schools in an effort to mainstream them into the formal education system. 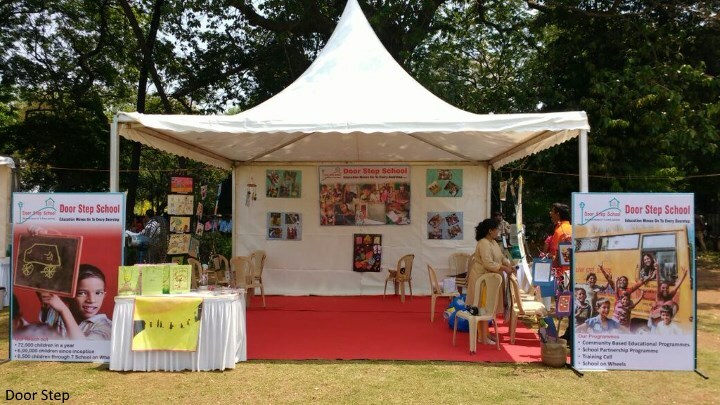 Door Step shared a photo of their tent at Oval Maidan. Magic Bus steers children towards a better life with awareness, life skills and opportunities. Their mentorship programme sees local youth volunteers trained to be mentors and role models to other children. They conduct ABC sessions and act as catalysts for community change. The children and youth grow up becoming confident, respected and responsible. 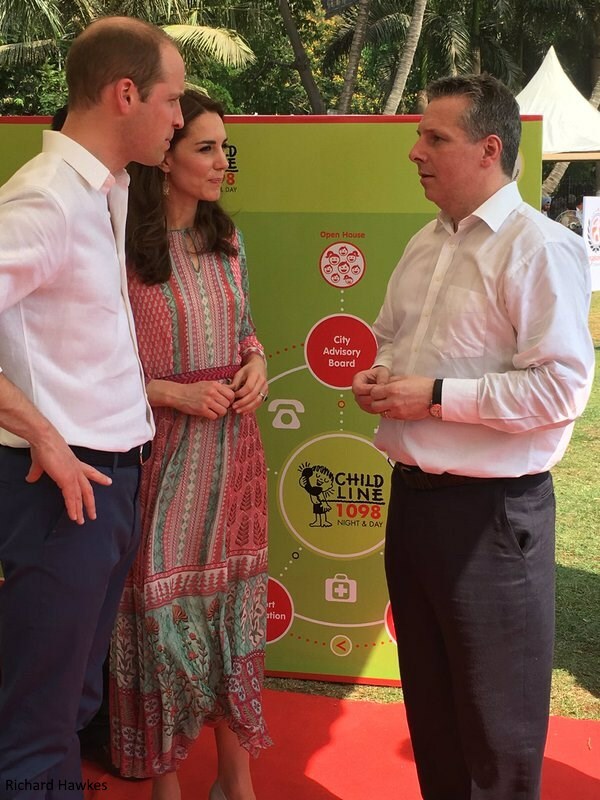 Those familiar with Childline in the UK will be familiar with the work carried out by India's Childline. Launched in 1996, Childline is the country's first toll-free tele-helpline for street children in distress. As of March 2015, a total of 36 million calls have been serviced by Childline operating in 366 cities and districts. 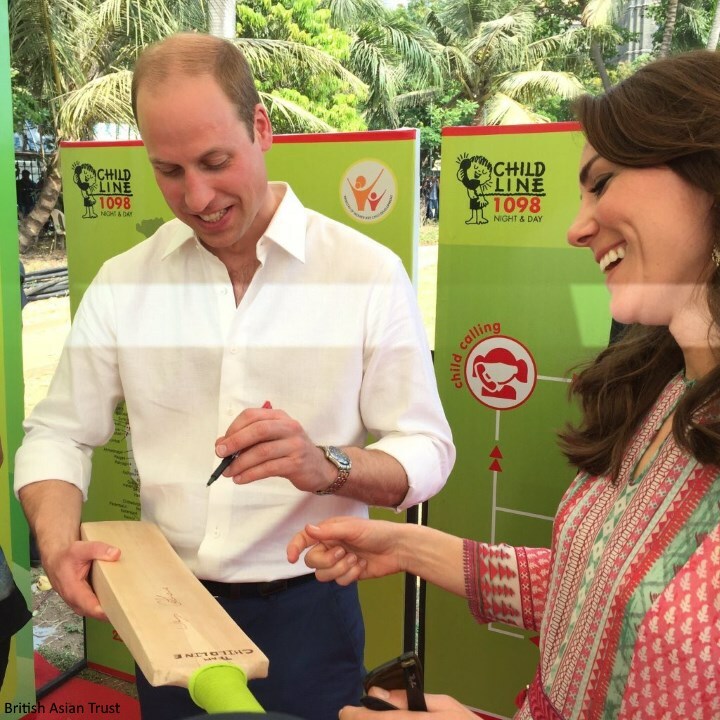 The Duke and Duchess signed a cricket bat. 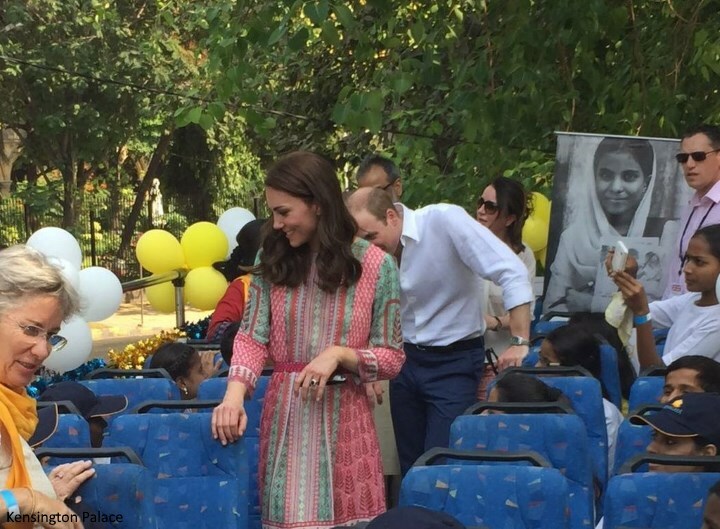 After their sporting events, William and Kate took an open-top bus tour of Mumbai with children from local charity Apnalya. The organisation works with the most marginalized people living in slums. The couple chatted with recipients of the charity as they took in the surrounding sights. 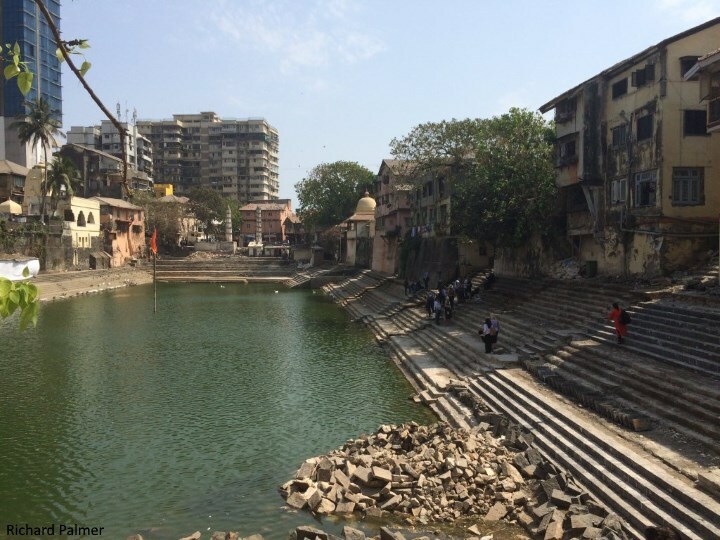 From here, the Duke and Duchess made their way to the Banganga Water Tank. Banganga is an ancient water tank in the Malabar Hill area of Mumbai. According to local legend, it sprang forth when the Lord Ram, the exiled hero of the epic Ramayana, stopped at the spot in search of his kidnapped wife Sita. As the legend goes, overcome with fatigue and thirst, Rama asked his brother Lakshmana to bring him some water. Lackshmana instantly shot an arrow into the ground, and water gushed forth creating a tributary of the Ganges, which flows over a thousand miles away called Banganga. William and Kate placed petals in the water in a traditional ceremony. A beautiful shot of the couple wearing garlands. Richard Palmer shared this photo of the tank. The couple then visited a slum. Kensington Palace said: "A visit here will allow Their Royal Highnesses to get a real sense of the complexity of this city. Alongside one of the most upmarket residential areas in Mumbai, they will see people who are living in tough circumstances in a small slum and are working hard to gain skills and make their way in the world." They met representatives of a charity called SMILE that focuses on skills and opportunities for young people and their parents. 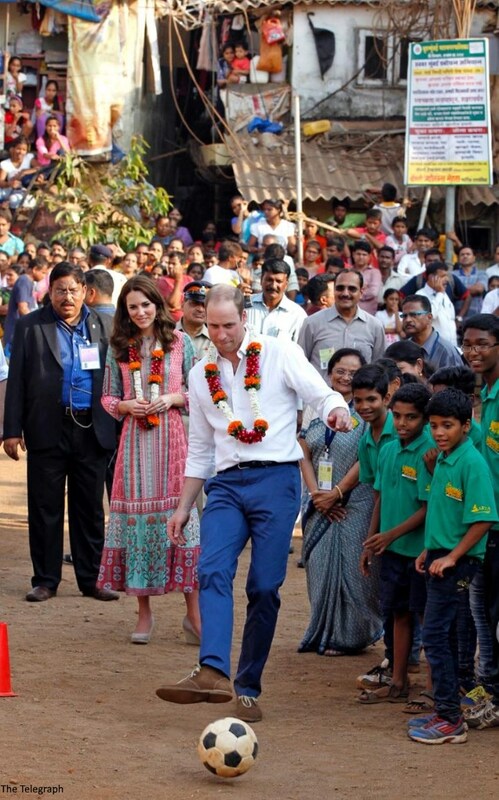 Prince William showed off his football skills. William looked very impressed with Kate's efforts. 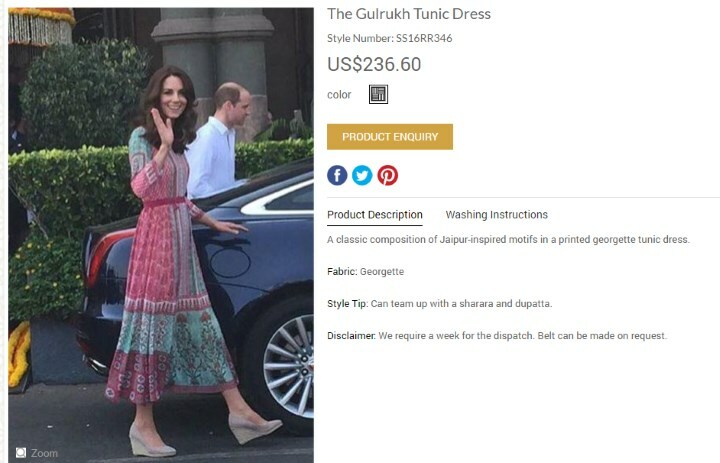 For her second look of the day, Kate chose a bespoke Mughal inspired tunic by Mumbai-based designer Anita Dongre. 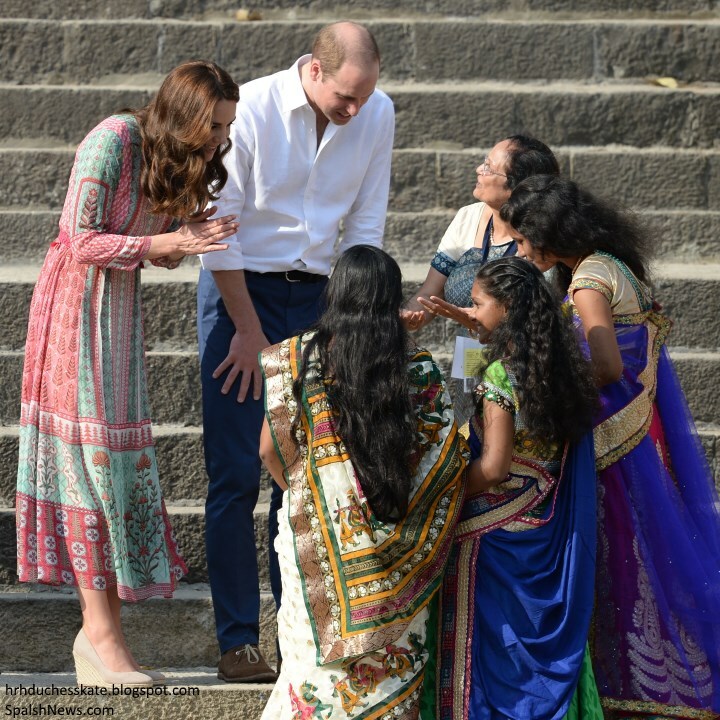 An aide said about Kate's dress by Mumbai designer Anita Dongre: "She wanted to wear a local designer at the earliest possible opportunity." It's wonderful to see the Duchess championing local brands and immersing herself in local fashion. The tunic was an ideal choice for the tour; the use of colour is fabulous. The Gulrukh Tunic Dress is now available to order for $236. The product description notes the piece is "A classic composition of Jaipur-inspired motifs in a printed georgette tunic dress". 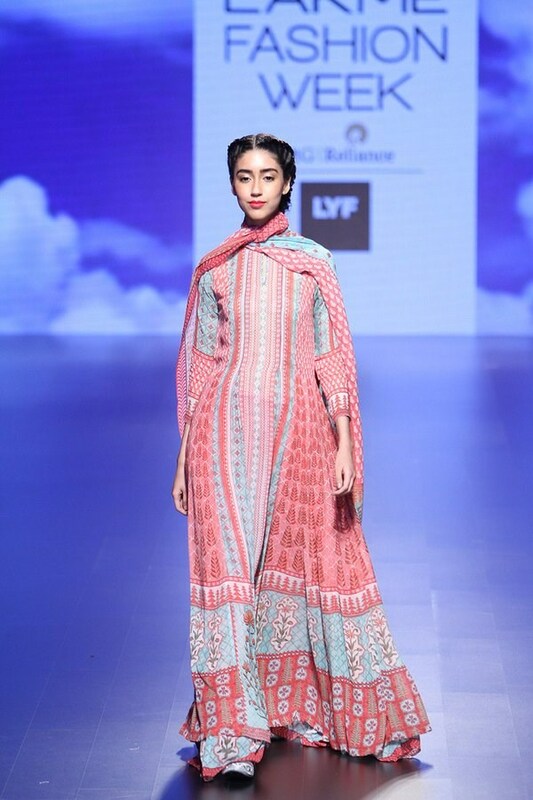 A look at the Summer/Resort 2016 style at Lakmé Fashion Week. Launched in 1995, Anita Dongre has been at the forefront of fashion for over twenty years, having created one of the most successful fashion houses in India. A metaphor for supreme craftsmanship, Anita Dongre’s designs showcase Indian aesthetics in a contemporary language. Inspired by Rajasthan and India’s rich craft tradition, her hand-crafted creations are coveted by brides across the world, including Bollywood celebrities. The Duchess debuted a new pair of wedges. Christine believes Kate wore the Fleur Wedges by Monsoon. The $79 espadrille wedges feature an almond toe and gripped soles that ensure a comfortable stride. 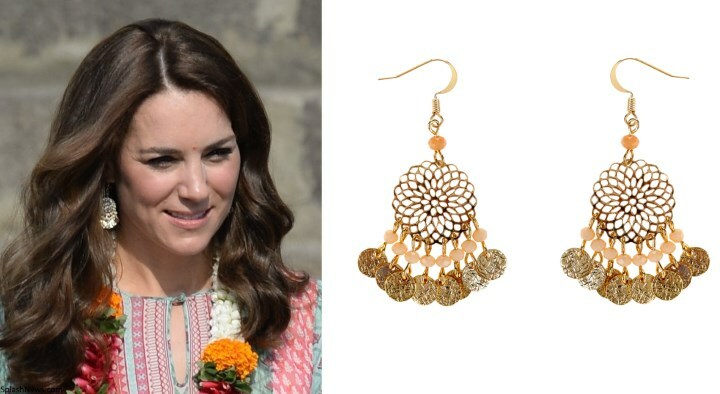 The wonderful Anna identified Kate's pretty new earrings as the £8 (yes £8) Filigree Bead Short Drop Earrings by Accessorize. They are embellished with faceted beads and small, beaten coins. The U.K. website can be found here and the U.S. site here. There's a very interesting video where Sachin Tendulkar talks about William and Kate. He described them as "remarkable and humble" available on YouTube. View a brief video from the cricket below! Next, William and Kate will attend a glittering gala! Gorgeous.Love both outfits so far, and better still love seeing the Duchess in her element.Engaged and confident.Terrific. Great coverage Charlotte. Thank you for all you do. Arigurl. I worship at the style altar of the Duchess of Cambridge! What a fabulous start to the tour! I love seeing Kate in ethnic designs and I previously expressed my desire to see her in indian outfits because I think she can pull off absolutely anything! Bravo to Kate for championing British designers like Mcqueen whilst still giving a sartorial nod to her host country with the gorgeous Indian-inspired design. And to champion a local Indian designer, I salute her. As an indian woman, I am so proud to see Catherine showcasing some gorgeous ethnic outfits. William and Kate are such an inspiration to the younger generation, it warms my heart to see them bringing awareness to children's causes and to see them interact with kids is priceless. I mean, they are seeing first-hand the plight of some of the poorest kids in the world and also bringing so much joy to them as well :) They are naturals. I recently read a not-so-nice article on the Daily Mail website which labels Kate as the "Duchess of Drab" which I personally did not agree with. Anyway, I think she pulled off today's look with aplomb and silenced her critics. I also noticed the lovely piece on Lord Ram included in this post, I can not express how proud I am to see Indian history being brought to the forefront Charlotte, thank u! So many parts and monuments of India have a very religious background which can be quite interesting. I noticed Kate is wearing a red dot in some of the pictures. For those who dont know, a red dot in Indian culture is used to symbolise that a particular woman is married. It is also traditionally accompanied by something called a "Sindhoor" which is a red powder, mixed with water to create a paste and it is then applied along the path of the hair, usually by the woman's husband. So if she has a centre / side path, it will be applied there. I love your comments Avee, and I concur. William and Kate are indeed an inspiration. Lovely to see them with the children. I too read that odious article in the DM. Absolute trash. What an amazing day! So many smiles! I especially loved the moment when William and Kate counted with the kids! Kate really seemed to know how to count to 5 at least :) And appearantly they both did great in the cricket as well (as far as I could understand among this foreign sport lingo!). I really like this look. This bohemian style is so perfect for summer! Really chic. She looks like she should be on the riviera with that dress when she wears the glasses :P Not in a "she looks too dressed up" way. Just that it's really chic. A really nice way to pay homage to the town and country without looking like she's playing "dress up". Very nicely done. And I LOVE earrings like those!! Great Post Charlotte!! I couldn't stay up last night. But I loved waking up today with 2 new post!! Plus my Twitter is ovwrwhelemed by all the new post!! I can't wait for her 3engagement. I'm excited for the beautiful dress, hopefully updue! Is it a plane, is it the light, no it's SUPER-CHARLOTTE!! Silvia and Rebecca of Sweden. I echo or second what you have written. Descriptions are beyond the written word. Just wow. Brilliant -Rebecca, I completely agree! You are spot on Rebecca. I bet her hairdresser is having kittens though. I thought in some of the Taj photos and again here that it looks like the heat and humidity is impacting on her curls. I'd be thinking about inventive ways to put hair up and back because if she's out for long in the heat she's going to look a bit limp. Waiting for her natural curls to come out. I've missed them! I love her natural curls :) She looks great! Can't wait to see them! I love her natural curls, wish she'd and Amanda Cook-Tucker would let it go that way more often. It takes 10 years off her look. With the intense heat and humidity, I'm a little puzzled why she didn't wear it up today, at least in a pony. I love (to see) her natural curls, too. Because she likes it? :P I mean... I get that she doesn't want to go with a full sleeve, and this way keeps it more modest and a shorter sleeve could either look too much beach or (if flared) too dressy. Wow! I Loooove Her Dress! I want one too:) lol What an Amazing Day Already! Clearly Such Fun had playing Cricket... Go Kate! She is Incredible Running & Playing Soccer (sorry Football:) in those Wedges! :0 She's Amazing! I got Chills seeing them in The Slums & if you cropped the pic to just they 2..... You could have inserted them into Any Other Visit They've made over 5yrs. The level of Respect & Humanity They Show to All.... Is Quite Humbling to me! What a fantastic start to the tour and the day isn't even over. The colours and energy and complexity of India are being showcased beautifully through today's engagements. Wow! I think this is my faorite casual dress I've ever seen Kate wear. It's perfect for the day. I don't get the shoes though. Why wear wedges if you know you're going to be running and playing cricket. I agree with Anon. It is sad that with her resources, her shoe sophistication for a summery day means only wedges.Furthermore she chooses them for a sport event too. I can't imagine, for a sporty person like her, how it makes sense. But maybe it is my fault to try to find sense in everything she does and wears. For what she was doing I feel a lower wedge, half that height would have worked well or just carry around a pair of slip on flats to change into for the sporting events. You can do it in higher shoes but at some point she will twist her ankle. Maybe she did much less actual running and moving than it looks like in the stills so that it was just a few moments of activity at a slow pace. I think those wedges would be fine with jeans but my biggest issue is they in no way go with that dress! That dress calls for a pair of flat sandals and she has the height for it. Fabulous outfit, fabulous post, thank you so much!! Great updates as usual. Bravo Charlotte 😊! What a fun, fresh look. Her athleticism in such tall wedges is awesome. Is it just a trick of the light in some of the photos or does she have a bindi (red dot) painted on her forehead? Nice touch if she does. As someone with my own head of natural curls I can tell you that the weather in India is most definitely going to get the best of Kate's hair. Day in and day out of hot, humid weather has a cumulative, full saturation effect. She can either embrace her curls or try to tame them with a neat up-do. I suspect we will see some of both...and why not, she'll look great either way. Absolutely! She almost always looks gorgeous, no matter what she is wearing. Lovely day. Alexander McQueen dress was so clever paying tribute to both countries and beautiful. Just one thing-it seems that there are some raffles at the waist...surprised to see a dress by a professional designer unraffling a bit!? Second dress is also absolutely lovely. I am intrigued at how the catwalk design is changed to a practical dress...I could never have such vision. If Kate saw the catwalk version and made her choice from that...she has creative vision! It must be very hard to see children living in such poverty...as a mom you mentally place your own child in that position and then the reality and horror hits you! Loving this tour so far!! I love this dress. It's fun, breezy, and the sunglasses up the overall "cool" factor. Great choice! Charlotte, to be honest, I was frustrated at the time it took for you to post this afternoon's activities but, after having viewed other blogs and sites all morning and then seeing your post, I really, really appreciate the difference in your style and see that it is WORTH THE WAIT! Other sources focus mainly on the fashion (nothing wrong with that) but yours adds so much substance along with the style notes. I feel like, and this is a big statement, if W&K could choose an ideal source for their activities it would be your blog. I feel like, because of the information you provide here, I know more about India - it's richness of color and culture and the poor-ness and struggles of some who live there. I imagine this is exactly what the D&D of C would want. I look at them as human spotlights - wherever they are, the attention of many are focused also and your style of blogging highlights their causes so well. Thank you very much for your lovely comment. I'm sorry you were frustrated with the wait, unfortunately posting depends on how long it takes photographers to upload their sets. Also, I understand about waiting on the photographers to upload. I was sort of picturing in my mind you waiting on everything to come in so that you could post. Charlotte, you post amazingly quickly. No one can compete with the speed of a photographer uploading a quick snap to Twitter! I am always impressed with how quickly you update! A solution that works well for me is: watch for quick updates and clothing reveals on Twitter, and then wait about an hour or two for it to show up here. That way, you get the best of both worlds. You get to see the clothes and pictures quickly, and then read up on it a little later. It's like icing on the cake. That said, Charlotte you do a fabulous job and I thought today's posts were quite quick! Amazing colourful dress she pulls it off so well what a natural pair they are together and how wonderful to share in a tour like this. Love Duchess Catherine she is so natural & gorgeous in all outfits; nearly 11pm in Australia I Need sleep been glued to Twitter and Instagram and Facebook for 7 hours: what fun! Charlotte don't know HOW YOU DO IT!!!!! Also meant to say Charlotte thanks for the info on the charities. Let's hope the combo of the cricket game & the two cricket greats especially Sachin Tendulkur gets their work lots of media coverage & donations. It looks like Blogger might have lost my earlier comment so here goes again. This is a fun & fresh look. Her athleticism in tall wedges is awesome. Is it a trick of the light in some of the photos or does she have a bindi (red dot) painted on her forehead? Nice touch if she does. She does though not from the very beginning. She does. She got the 'tika' when the duchess and the duke visits the water tank. I didn't even notice the tassles. Those are a really cute! Haha, if that happens I will make us some popcorn for us to enjoy! In the listing for the dress ,it says the belt is not an Anita Dongre product. So it looks like Kate got if from somewhere else. Another wonderful post, as usual! I thought that toward the latter set of photos (visit to the slums) it looked as though Kate may be sporting a bindi. Did anyone else notice this? Perhaps it's just a blemish? I love these first two looks! Charlotte, was the designer of the tunic one that was mentioned by you in pre-tour posts? I didn't recall the name? Everything is fabulous thus far and I'm loving it. Looking forward to the gala tonight! What fabulous pictures of her playing cricket. I love how she interacts with the children. Kate is really in her element. And, she looks gorgeous. Love this breezy look. Thanks Charlotte, you are a wonder. Oh dear, I'm in the minority but I'm not loving these two looks. The first outfit was nice but a plain top or skirt would work better for me, but the second outfit. Oh dear, no. Looks like a pair of curtain material to me! If I wore this id look frumpy. Nice to see her having fun with the cricket and the length of dress worked for that. Mixed feelings. I haven't posted in a while because, as I have stated I am here for the clothes, and nothing Kate has worn in a long while has inspired me enough to write my thoughts down. However, I am in love with this dress, wish it was a few inches shorter but that is the most minor squabble. Bohemian with the natural hair, I love when she wears wedges (unless it is the dreadded corkswoons that she seems to have thankfully retired.) It just looks effortless, and she has confidence in this outfit. I often feel like she doesn't have confidence when she wears the more dowdy ensembles, and it shows. I want her to look like this more often!!! What a great look for DoC. I love this dress and really like the wedges. Those are very pretty earrings. What a wonderful day of engagements so far. They were really in their elements today. So many great memories were made by all involved. So interesting to learn about the culture and charities. It's not in earlier photos... dust maybe? Can someone else confirm I am not crazy? OMG I wondered about that too! 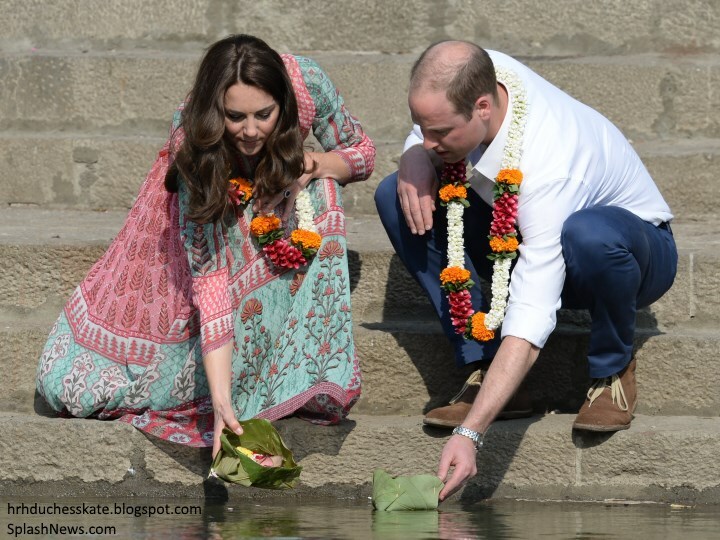 The photos shown here don't include the photo of an Indian woman applying a red bindi dot to Kate's forehead. But it's definitely a bindi. Very pretty dress! Perfect choice for these engagements. Looked graceful as she moved. The earrings are beautiful. Looking forward to tonight's gown. Kate has gone two for two for me today! I love this dress! It is something I would wear! It looks so comfortable! Best look ever. Colorful, cool, refreshing, stylish, flowing. Comfortable fashion. Who knew? LOL. She looks radiant! Great start to her tour wardrobe! THANKS CHARLOTTE! I hope you find time to sleep. You're amazing! Oh I love this dress on her. She blends in so well and yet also stands out, And as Anon 14:05 said, it looks comfortable and cool. I think I have had about 3 hours' sleep--this is going to be a rough week! LOVE this dress--very appropriate for this event. She looks gorgeous! I love when she wears patterns and color! My hope and dream is to see a pair of funky shoes on this tour and not just the same wedges or plain court shoes. Please, oh please! Oh I'm so excited for this tour! I will not be able to follow every event at the right time but, at the end of every day, I will check this beautiful blog of yours :) Thank you for keeping us updated!! I love your post 😍 and i think the duchess and the duke both looking good. Both duchess Catherine's dress really represent the country well especially those 2nd earrings. I'm looking forward for the gala this night. Great coverage Charlotte! Great cultural insights to all your readers! THis is a very beautiful dress that the duchess chose! Anita Dongre is an amazingly talented designer. Her clothes are very light yet elegant. Every season she comes out with better designs. The wedges are nice but I wish the duchess wore flats especially for such sporty events. For more comfort. William looks very handsome! Can anyone identify his shoes? They both look beautiful in the garlands, don't they? I absolutely love this look! I'm sure the fabric was light and airy, which was probably much more comfortable in the heat. It is local without looking unnatural. They look really happy, and something tells me we will all forget the "workshy" argument by the end of this tour. Can't wait to see what she wears tonight! I was wondering... does her hair looks blonder or I'm wrong? I think they look flawless! I haven't read the comments yet but I just saw her jumping in her wedges in the picture on DM and almost fell out of my bed. Those will be some killer shin splints. I ran in some Jeffrey Campbell flats (well padded) from my parking lot to the office on Friday and I still feel my shins hurt and I am quite athletic myself, so my shins get beaten up regularly. If she landed on her heels she will feel it for a few days. I really strongly disliked the earlier paisley McQueen - Alexander will be rolling in his grave right about now. But I love love love this cricket dress. I would totally buy it for myself. Really loved this dress and the whole look ! She looks happy and relaxed, much better than the arrival. Thanks for the great work, as always, dear Charlotte �� ! I have to laugh because this is the sort of thing I wore travelling in my nasty little hippy days and I never failed to be stopped by airport security who was certain I had to be smuggling something! Dresses like that packed like a dream in little space, washed and dried in cheap hotels and told no tales, either from what you had for dinner or who you were with. Mr Leo fell in love with me in spite of my lank hair and lank - although festive - Indian cotton dresses and bangles and beads. Needless to say, I could never wear that professionally but how delightful it was to throw off my formal suits and set off. Deja vu! Which is so funny, because professionally, this is perfect for Kate today, I love it! I was wondering what on earth she could wear for cricket, for a spot of sacred tourism and for visiting those who are so disadvantaged without causing offense with something to costly; what to wear while being modest, while showing off the lovely fabrics of the nation and while still looking like a princess and dressy enough to do honour to those she visited. And she did it! This is one of my favourite engagements in a long time - showing the ease William and Kate can bring, playing with the children, riding in (what was probably blazing hot) top of a bus with others to the water tank, instead of in a formal car, mingling easily in the slum, fitting in and yet standing out and bringing wonderful cheer with them from one nation to another - simply wonderful! Julia, I love everything about your comment! I agree Julia, just perfect. Loved your comment. Julia, lol, so you were around in the hippie days also. I can relate to what you were saying. Deja Vu indeed. Certainly reminded me of days gone by. Thanks for sharing. With all due respect, this is not a tunic. this is a dress. a midi dress. no different than I would see at many retailers currently (H&M/Zara/Banana Republic). I think we should try to make it be something that its not. the pattern as Asian motifs, I'll give you that. Nice! This is a 'again' a very fitting look. I was hoping she's appear in something by a local designer very early in the tour. Bohemian chic at it's finest. It does - as many comments noted - appear breezy, cool, flowing, and easy to wear for an event such as this one. I appreciate that she wore super cute earrings that anyone could purchase and I think they look great! Charlotte - love the clock you added to the site - Nice touch! I noticed that in the photos from later in the day, Kate has a red or brown point between her eyebrows. Is this just a pimple or blemish that wasn't concealed with enough makeup or was a traditional Indian/Hindu point placed there (I believe it us called a bindi)? I am really curious about it!! Awesome! SO GLAD she changed out of that impossibly hot suit she wore at the official arrival!! This is a beautiful dress and I applaud (and am relieved) that she's keeping the jewelry and accessories affordable and practical. Love the wedges and while they aren't Jimmy Choos, they are absolutely practical and appropriate for the activities, for running and playing with the children, for walking on those uneven streets, bending and kneeling. Yet another illustration of why it is so frustrating that Will and Kate don't do more - they are just so good, so natural, so hands-on and genuine at their royal duties and with crowds. Charlotte, on a more personal note, I have to congratulate you and say "WOW!" on the awesome new header you designed for your blog for the royal tour!! I love it! You need to go to work for WillKat in PR/graphic design!! You blend wardrobe and event information seamlessly, quickly, accurately and fairly. Well done!! Her dress is gorgeous!!! I absolutely love it! I have a pair of espradille shoes myself, (albeit, only two inches) and they are perfect for both casual AND formal outfits. So far she has been gorgeous, maybe a few tweaks here and there. I am holding my breath for tonight`s gala-breathtaking updo and gorgeous gown, please! OMG. I LOVE this dress. The entire look is fabulous. I believe this is my favorite look she has ever worn. Finally, an age appropriate dress for her. I know she needs to present a certain look, given her position, but she usually dresses for someone twice her age. This look is youthful, fun, and so beautiful. I understand that it's fitting for the country she's visiting, but I so wish she would keep her look youthful, fitting for who she is and her age. Kate - you're young, dress as though you are and have fun! Thanks for a fabulous post. Kate looks so beautiful. This dress is beautiful as well as being comfortable and practical. It needed to be roomy to cope with Kate's antics on the sports field! And the skirt was long enough and the fabric had enough weight so that when those pesky breezes started up Kate was spared major embarrassment. Such a beautiful print, I'm so glad she's found another super designer to focus on. I really like this tunic. I really, really like it! love that she put a little belt with it. Shoes set it off just right. I love this dress! I love the colors! I love that it is an Indian designer! It looks so comfortable and it was perfect for engaging in cricket and football! The Duke and Duchess both looked so full of energy after a red-eye flight! All very good causes to support! And the shoes--I want a pair myself! The pink patterned hippie dress has such a "street market look" and not in a good way. Please send it to Goodwill. She could have gone for the modern open refreshing daisy lace look. Many thanks, Charlotte, for the excellent coverage. I just hope you have time to get some sleep, too! I'm so glad William and Kate visited the slum! Surely it brought joy to the people there. And I like the ceremony of the putting the petals on water. I'm sure all these moments are very special for them and they will remember them a long time, even though they may have to look at photos to refresh their memory - there will be such a lot of memorable situations! Looks like they are in their element, meeting new people in this vast world and sports. Lovely! The dress for cricket and the water tank are perfect. The colours and pattern suit the locale, the length of the dress makes kate pretty for a royal event but not too stuffy to visit a slum and play cricket, and the light weight material and 3/4 sleeves works well in the heat. And to go with an indian designer right off the bat (no cricket pun intended) was fantastic to see. Brilliant job Will and Kate! 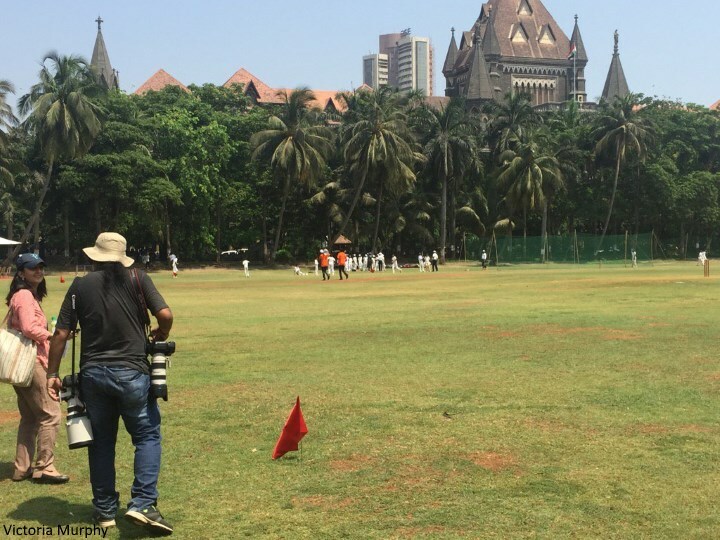 The days engagements have given some of the great sights and activities of Mumbai. I enjoyed reading and seeing the days engagements through pictures. 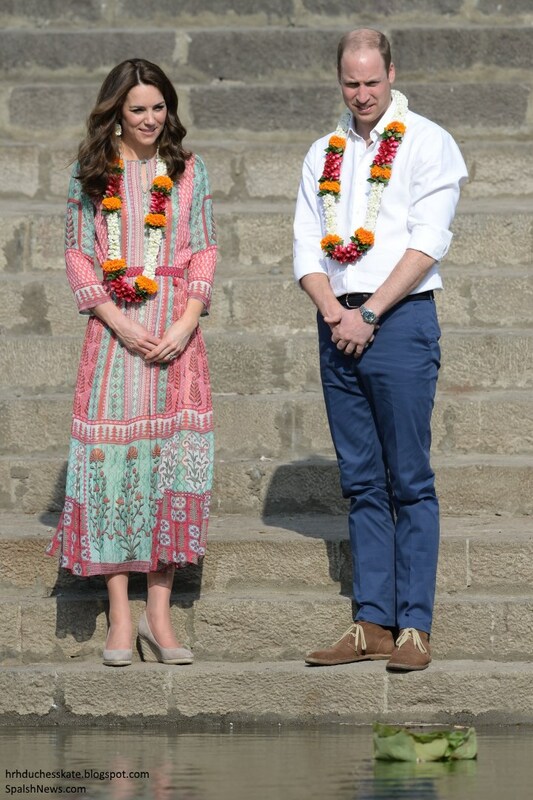 William and Kate looked engaged with the people and very happy to be in India. I love that they were described as "remarkably humble" and made everyone feel very "comfortable". I think it shows their true heart and character. It's wonderful they were so involved with the activities at Oval Maidan. Kate is definitely a natural and kudos to her for playing and running in those wedges. Seeing the couple pictures of their visit to a slum area really puts things in perspective. How wonderful for those people to see Will and Kate and for them to know they truly care. There were great photos from the day and ones that will be seen for years to come. I LOVE Kate's dress. The colors and style were lovely! It was a great choice for Kate for the days engagements and it looked so pretty on her. William didn't look too shabby either in his casual wear. :) A beautiful day and a beautiful couple! 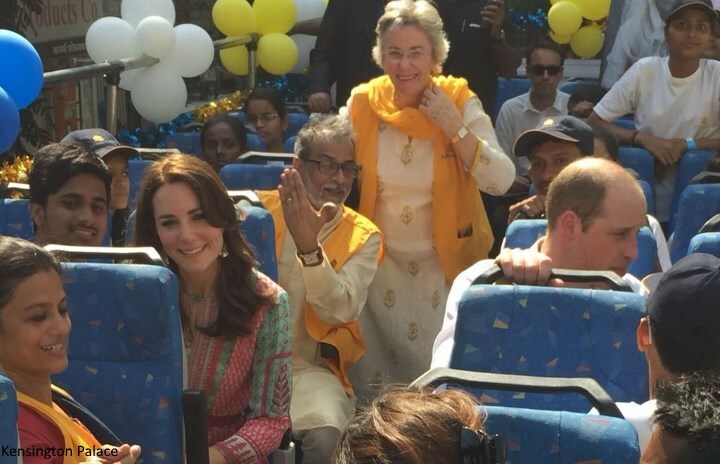 One of the Anonymous folk commented somewhere above that she/he felt it was disrespectful that William & Kate are doing such a whirlwind tour of India. After mulling it over, I came to this conclusion: 1) Royal tours are expensive. Both on Britain and on the host country. Especially these days where there is always a threat of terrorist activity. Much as both gov'ts enjoy the publicity, I am sure there is a heavy sense of relief when the visitors are waved off. 2) How long are W & K supposed to spend in the slum areas (I mean no disrespect by using the word slum, I hope)? I thought there was a telling remark by one of the people there who said that no Indian celebrities have even come to the slums officially. But W & K did. Now if only those millionaires who have their homes a few blocks away could be persuaded to ante up some of their rupees. 3) Their trip was well researched and focused on the causes they have adopted as well as the obligatory governmental niceties. The Queen hasn't been to India since 1983, Charles has been there multiple times. Years stretch ahead where W & K can go back again themselves. But they don't have to spend weeks there; the fact that they did come and have obviously put as much thought and effort into one week as they have counts a lot. Is it better for them to have lots of activities or to do just a few ceremonial ones? Either way they are going to be raked over the coals. Why not set their own pace? 4) I am so tired of people comparing them to Diana in an unfavorable way. I was as much enthralled with Diana in her day as I am with W & K. At least until the stuff between her and Charles veered into the embarrassing. This is the legacy that W, and by extension K, have to deal with. Is it any wonder they are carving their own way and, frankly, I would much prefer to see photos of a happy Duke and Duchess who are quite clear about who and what they are, than the hand wringing and lies that took place in articles, books, and TV interviews. I think the reason I was so disappointed with this dress is that the colors were so muted. Mostly though the Temperley options that Charlotte chose were so beautiful that this pales in comparison. And the wedges I did not like at all. There are many other pretty yet comfortable options. Like the sledge heels, the wedges have to go. I thought a tunic was a top, but you learn something new everyday. Love the dress, the belt really makes it for me. Not sure if the length was changed, or it just appears shorter because of Catherine's height. Comfort means inner transformation at times. This dress seems to have done that for Kate. Playing cricket while wearing it? that makes a nice segment for a movie. The earrings have worked out and at a bargain prize too. Actually it is when she lifted from the ground kicking the ball that is the funnier one. I can imagine her kids giggling at those images. She looks nice but this is the wrong outfit to play cricket and soccer in. She should be wearing pants and runners! Congratulations on the identification of the Monsoon Fleur Wedges. Managed to get myself a pair and the Accessorize earrings. Thanks so much for such a speedy and accurate post.